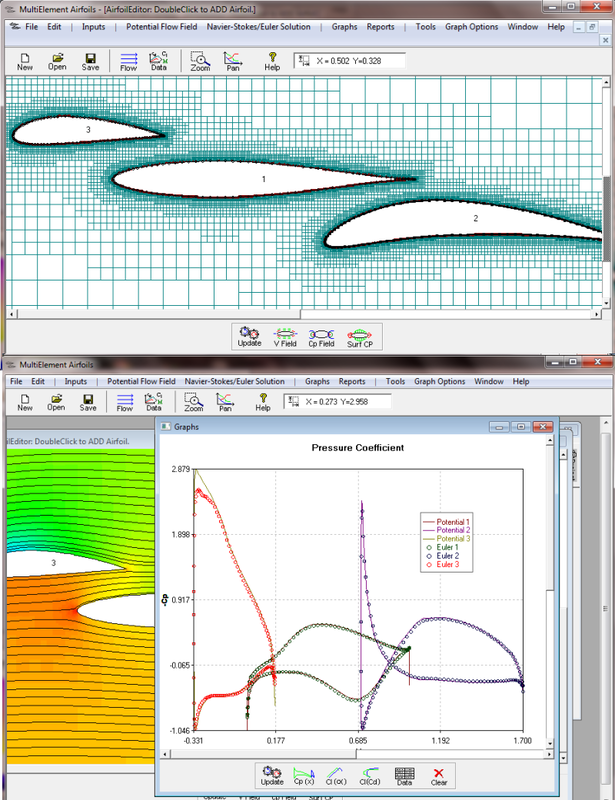 Stallion 3D is a modern aerodynamics and computational fluid dynamics (CFD) analysis software tool. The software allows users to bypass the time-consuming grid generation step and setup their problem for analysis in just a matter of a few seconds. 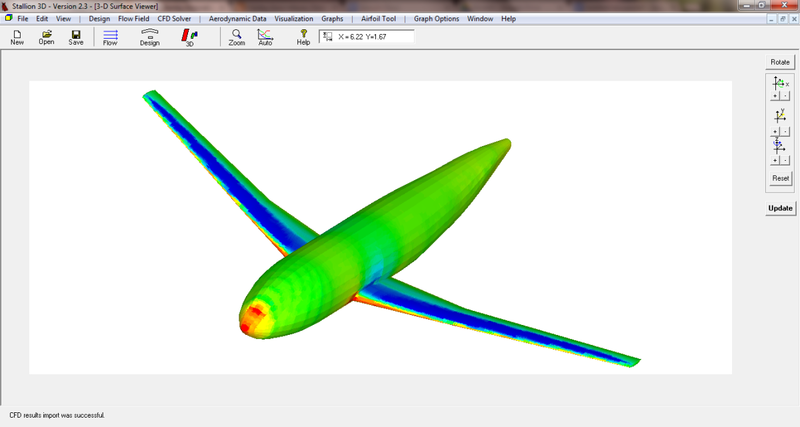 Stallion 3D is the best tool for aerodynamics analysis of arbitrary geometries on your MS Windows PC. 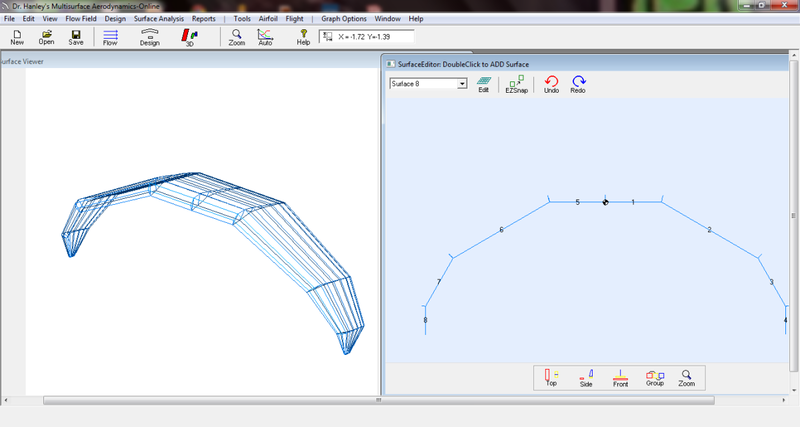 The following pictures are results obtain using Stallion 3D for a lift and drag study of the DLR F4 wing-body. The geometry was obtained from NASA OpenVsp hangar. Extensive data for this study was obtained from NASA 1st Drag Prediction Workshop (DPW1). The url is: http://aaac.larc.nasa.gov/tsab/cfdlarc/aiaa-dpw/Workshop1/workshop1.html. 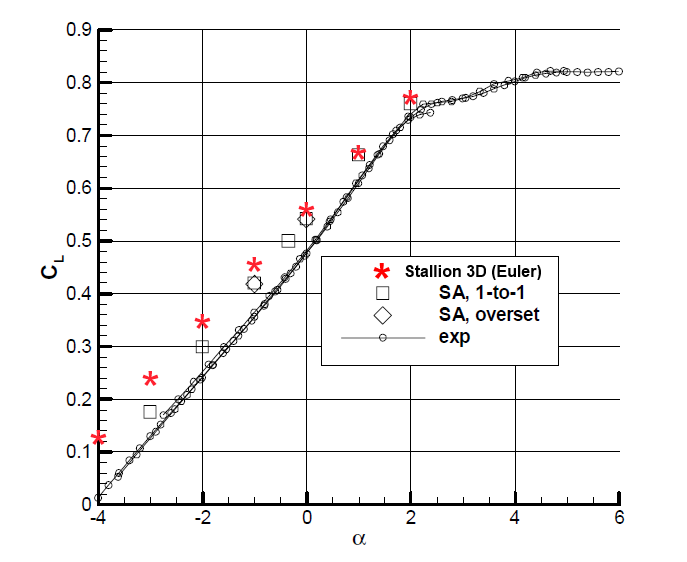 Only 500,000 computation cells were used for the present Stallion 3D analysis. Results were obtained after 4 hours of computation time for each angle of attack using a laptop computer under MS Windows. To speed-up the simulations, two cases were run simultaneously on the laptop. This allowed a complete study in less than 24 hours. and CFL3D (as reported during DPW1). against the total drag from CFL3D and the experiments. Pressure coefficient a station along the wing at 2 deg angle of attack. The lines are for results obtained by CFD3D as presented at DPW1. Thanks for reading. Do not hesitate to telephone us at (352) 240-3658 or email at hanley@hanleyinnovations.com if you have any questions. 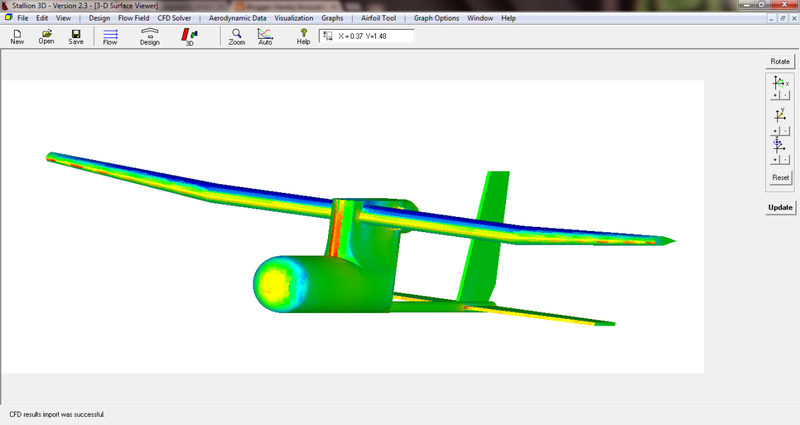 Its amazing how quickly a designer can compose a working airplane with 3DFoil, our interactive analysis and design tool. The following video shows how airfoils and 3D planform shapes work together to size & determine stability of a new designs. Since interactive is a word that is often used to describe computer programs, I would like to list 5 benefits that 3DFoil brings to interactive aircraft and hydrofoil design. Benefit 1: The airfoils are all built into the program. Unlike other CAD software, you do not have to browse the web to find airfoil shapes for your new designs. Benefit 2: You can analyze the airfoils on the fly. You can test and compare candidate airfoils in a matter of second using the built-in airfoil analysis tool. Compare Cl, Cd, moments and the angle for maximum lift of your airfoil shapes. Benefit 3: Interactive means using the airfoils in 3D wing planform shapes and immediately getting the lift, drag (vortex and profile) and moments. As shown in the video, this only take a few seconds. Benefit 4: An airplane is like a bicycle (the Wright brothers built bicycles). It must support a payload and it should be properly balanced in flight. This means interactively determining both the longitudinal and lateral stability derivatives to ensure the performance of your design. Design and analysis of kite-surfacing canopy. Benefit 5: 3DFoil interactive means that you will have something concrete to show for your efforts. The software can export both .dxf files of the airfoils and a 3D .STL file of the surfaces. You can use these for 3D-printing a fully working prototype for wind tunnel testing. Thanks for reading. Do not hesitate to contact us at (352) 240-3658 for more information. The business for small hand launched UAVs can be quite lucrative. Make no mistake, however, theses aircraft are not high-priced model (toy) airplanes that you can just sell to the government. UAVs that are highly coveted for surveillance work by private and government organizations must be extremely durable (tough), all weather and have the range and endurance to fulfill their mission. They must also be quiet. 3D Analysis using Stallion 3D. Colors show surface pressure. The above specifications presents a myriad of conflicting design requirements that must be successfully navigated by the UAV aerodynamics engineer. The aerodynamics software by Hanley Innovations is the only suite of programs that equips the designer with a set of tools to complete their tasks in a timely manner. For example, Stallion 3D, a full-fledged aerodynamics software package, requires no user grid generation. The workflow to setup a simulation takes seconds and the software runs on an ordinary PC or laptop computer under the familiar MS Windows environment. The following video shows the process. 2. A wing/body (fuselage) combination that provides high lift and low induced drag. 3. Good longitudinal stability characteristics (marginally stable UAVs are difficult to fly and gets damaged during landing and takeoff). 4. Good lateral stability characteristics and damping derivatives. More information about our suite of software can be found a http://www.hanleyinnovations.com. You may also call us at (352) 240-3658. The hallmark of any process innovation is the elimination of a significant step (or number of steps) from the workflow and yet maintain (or improve) the high standards of the final product. Hanley Innovations CFD products (HanleyCFD) remove the grid generation step from your workflow during the computational fluid dynamics, CFD, analysis of your product. This speeds up the design process and gives you an advantage over the competition. Since saying automated gridding is a honor that all software can boast (we are using a computer for CFD after all), here are 5 tasks and worries you can definitely leave behind when you analyze your designs using HanleyCFD. 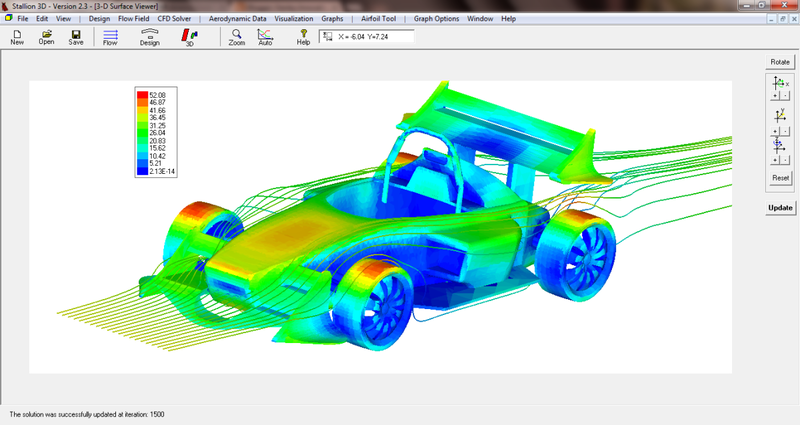 Finish your analysis today with HanleyCFD (STL from GrabCAD). There is no need for worrying about grid quality. Every single cell in a HanleyCFD grid is Cartesian, i.e.a rectangular hexahedron (my old notes from 18.335 say that these are the best grids for CFD). Furthermore, there is no overhead in transforming the 3-D Navier-Stokes and Euler equations to conform to a surface fitted grid. You can solve them the way nature intended (in Cartesian form). 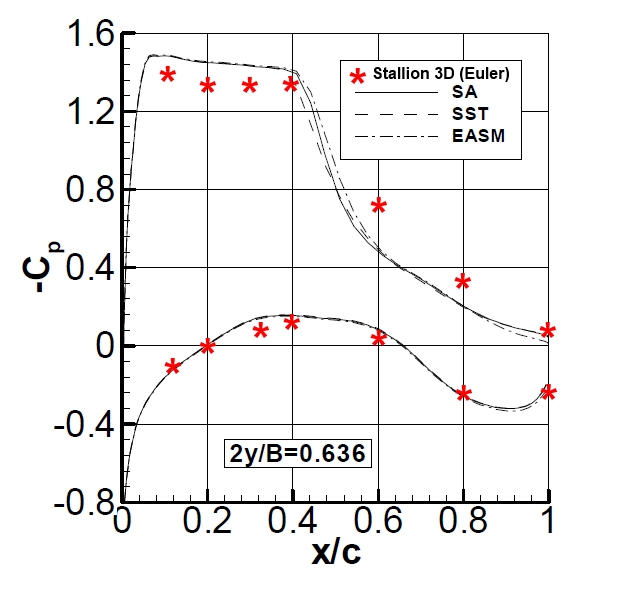 Comparison of Cartesian Euler Solver & Potential Flow in MultiElement Airfoils 5. A small nick, scratch or bump on a CAD surface mesh can send an extrusion based grid generation process awry. It is the painful equivalent of bare footing a tack (or Lego piece) on an otherwise smooth floor. With HanleyCFD, there is no need for a time consuming cleanup of the CAD surface. Small features can stay and save you time in the analysis work flow. You can just ignore these cute little triangles with HanleyCFD. CFD based on tetrahedral grids can have accuracy problems if they encounter these features. Increasing the mesh resolution can often exacerbate the problem and lead the solver down an endless inverted oblivion. The following video shows how Stallion 3D, the HanleyCFD flagship, deals with a geometry mired in small acute angles. Watch this video to see the workflow from analyzing difficult geometries. HanleyCFD helps you to avoid the long debate (with yourself or team members) whether or not a geometry feature is important to the analysis and the physics of the flow. Keeping a feature translates to more time performing the mesh generation. By removing the feature, you can miss an important physical result. HanleyCFD will analyze the feature without the extra time spent for mesh generation. Too often, you are forced to modify your design to appease cost and time constraints of the analysis workflow. With HanleyCFD, you have no problems analyzing the concepts that can change the world. 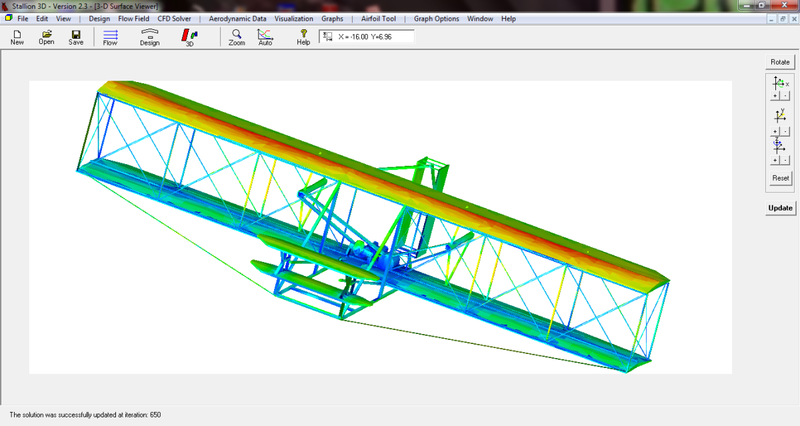 Stallion 3D analysis of Wright Flyer (TurboSquid model). HanleyCFD and Stallion 3D can be purchased at http://www.hanleyinnovations.com. Please call us at (352) 240-3658 for more information.